Johns Hopkins not only pioneered the research university in the United States, it was and continues to be a leader in several areas. Of particular note is its world-renowned medical facilities and medical training program, which also happened to pioneer the acceptance of women into the field. Johns Hopkins continues its tradition of cutting edge research and high academic standards, producing several Nobel laureates as well as numerous alumni successful in a wide variety of fields. The university was founded with the vision of advancing not only the knowledge of its students but human knowledge in general. Johns Hopkins strives for the pursuit of external knowledge and training students to be able to find it and to distribute it to the world, and in many ways it attains this goal. However, human beings are not only external and physical, but also internal and spiritual in nature. When the internal character of a person is not well developed, the knowledge they gain can be abused, causing suffering to others. Advances in human knowledge that will truly benefit society, as Johns Hopkins strives to attain, need more than training in the external aspects of life, they also depend on development of internal knowledge. The encouragement of research… and the advancement of individual scholars, who by their excellence will advance the sciences they pursue, and the society where they dwell. Its motto in Latin is Veritas vos liberabit – "The truth shall make you free." Johns Hopkins is known as a research university, having adopted the Germany university model which emphasized specialized training and research. Today it is world-renowned for its medical facilities, and also is of note for its Peabody Institute, a professional school of music, as well as the Paul H. Nitze School of Advanced International Studies. It also maintains the Johns Hopkins Press, founded in 1878, which is the oldest continuously operating university press in the United States. Hopkins is no stranger to significant monetary gifts; in 2001, Sidney Kimmel, founder and chairman of Jones Apparel Group, donated $150 million for cancer research. Though Kimmel’s gift is the largest single gift in the university’s history, alumnus Michael Bloomberg's confirmed personal donations total over $200 million. Bloomberg, whose first donation of $5 was given in 1964, the year he graduated with a degree in electrical engineering, is the largest individual benefactor in the university's history to date. According to the National Science Foundation ranking, Johns Hopkins performed $1.49 billion in science, medical, and engineering research in fiscal year 2006, making it the leading U.S. academic institution in total Research & Development spending for the 28th year in a row. The university also ranked first on the NSF's separate list of federally funded research and development, spending $1.277 billion in FY2005 on research supported by such agencies as the National Institutes of Health, NASA, the NSF and the Department of Defense. In FY2002, Johns Hopkins became the first university to cross the $1 billion threshold on either list, recording $1.14 billion in total research and $1.023 billion in federally sponsored research that year. A few months ago I was told that the Johns Hopkins University had given me a degree. I naturally supposed this constituted me a Member of the Faculty, and so I started in to help as I could there. I told them I believed they were perfectly competent to run a college as far as the higher branches of education are concerned, but what they needed was a little help here and there from a practical commercial man. I said the public is sensitive to little things, and they wouldn't have full confidence in a college that didn't know how to spell the name 'John'. More than a century later, we continue to bestow our diplomas only upon individuals of outstanding capabilities and great talent. And we continue to spell Johns with an 's'. The best teachers are usually those who are free, competent and willing to make original researches in the library and the laboratory …. The best investigators are usually those who have also the responsibilities of instruction, gaining thus the incitement of colleagues, the encouragement of pupils, the observation of the public. Johns Hopkins was the first university in the United States to emphasize research, applying the German university model developed by Wilhelm von Humboldt and Friedrich Daniel Ernst Schleiermacher. Johns Hopkins is the first American university to teach through seminars, instead of solely through lectures, as well as the first university in America to offer an undergraduate major (as opposed to a purely liberal arts curriculum) and the first American university to grant doctoral degrees. As such Johns Hopkins was a model for most large research universities in the United States, particularly the University of Chicago. "Following the lead of the Johns Hopkins University in Baltimore, fifteen American institutions came to define the American research university…." 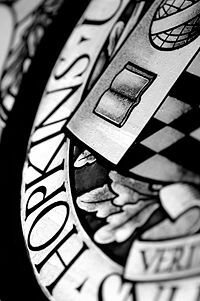 The Johns Hopkins Press was begun in 1878, inspired by Gilman's view that: "It is one of the noblest duties of a university to advance knowledge, and to diffuse it not merely among those who can attend the daily lectures—but far and wide." Today the Press continues to fulfill that duty, publishing books, journals, and online across the Internet. With the opening of The Johns Hopkins Hospital in 1889, followed four years later by The Johns Hopkins University School of Medicine, Johns Hopkins pioneered a new era of medical education. At the time, American medical schools had low entrance requirements and poor educational standards. Johns Hopkins established a new curriculum marked by an emphasis on the scientific method with the incorporation of practical experience at the hospital as well as laboratory research. The undergraduate student population at Hopkins was all male until 1970 although many graduate programs were integrated earlier. In particular, the medical school accepted women from its inception as a condition of the endowment given in 1893 by a group of wealthy women devoted to the feminist movement. As a part of the donation, Hopkins was required to donate part of the land for art. As a result, the Baltimore Museum of Art, which is not part of the university, is situated next to the University's campus, just southeast of Shriver Hall. The statue in the middle of the pool, the Sea Urchin, was sculpted by Edward Berge. It stood in Mount Vernon Place, near the Washington Monument, for 34 years before being replaced by a 7'10" copy, which fit in better with its monumental surroundings. Frank R. Huber, the man who left the city the money to make the copy, asked that the original be given to Paul M. Higinbotham, who donated it to the university. 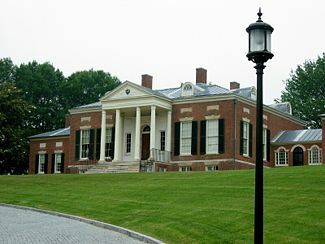 North of the campus, also on Charles Street, we find the Evergreen House, one of Hopkins' museums. This urban campus is in the East Baltimore neighborhood and is home to the School of Medicine, the Bloomberg School of Public Health, and the School of Nursing. It comprises several city blocks spreading from the original Johns Hopkins Hospital building and its trademark dome. The School of Medicine of the Johns Hopkins University is associated with clinical practice at Johns Hopkins Hospital. Only two of the MSE library's six stories are above ground; the rest are beneath, though architects designed the building so that every level has windows and natural light. The design accords with a bit of traditional campus lore which says no structure on campus can be taller than Gilman Hall, the oldest academic building. There is no written rule regarding building height, however, and the library's design was chosen for architectural and aesthetic reasons when it was finally built in the 1960s. 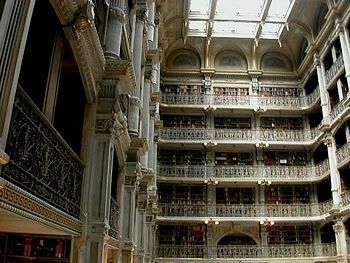 The Peabody Institute Library was begun with the June 16, 1852 donation from George Peabody. George Peabody was born in South Danvers (now Peabody) in 1795 and by the year of 1851 had risen in the business world to become an investment banker in London. Danvers Mechanic Institute's decision to name George Peabody as an honorary member. Proud of their native son, the Danvers Mechanic Institute named George Peabody an honorary member on January 5, 1852. This subscription based institute, located in South Danvers , was both library and lyceum. Though the committee selected to inform Peabody of this honor waited until after Danvers was informed of the donation, it is possible his awareness of this institution influenced Peabody in deciding the type of institution he wished to create. 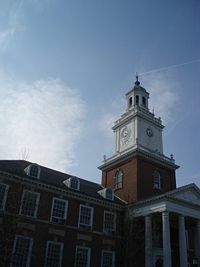 Located at the university’s Homewood campus at the Charles Village neighborhood in northern Baltimore, the Zanvyl Krieger School of Arts and Sciences is one of nine divisions of the Johns Hopkins University. Directly descended from the original Johns Hopkins University, which was founded as the nation’s first research university in 1876, the Krieger School is the core institution of the university and offers undergraduate and graduate programs. With over 60 undergraduate majors and minors and over 40 full-time and part-time graduate programs, the Krieger School’s educational offerings also summer programs available to high school students, undergraduate students from any college or university, and a post-baccalaureate pre-medical program. Among these academic programs, the Krieger School’s Astronomy, Biology, Creative Writing, English, German, History, and History of Art departments are among the top-ranked in the nation. In addition, not only are faculty members expected to spend as much time researching as teaching, but also, there are numerous research opportunities for both undergraduate and graduate students, ranging from the university-sponsored Woodrow Wilson Undergraduate Research Program to the nationwide Fulbright Hays Program for graduate students. In 1961, the School of Engineering changed its name to the School of Engineering Sciences and, in 1979, was renamed the G.W.C. Whiting School of Engineering. The school's named benefactor is George William Carlyle Whiting, co-founder of the Whiting-Turner Contracting Company. The Whiting School of Engineering today provides academic instruction in a wide range of disciplines in nine undergraduate departments, ten graduate departments, Engineering Programs for Professionals (part-time), and the Center for Leadership Education. The Johns Hopkins University School of Medicine, is headquartered at the university's Medical Institutions campus in East Baltimore with Johns Hopkins Hospital. The Bloomberg School of Public Health, founded in 1916, is the first and largest public health school in the world. The Paul H. Nitze School of Advanced International Studies, based in Washington, DC, near Dupont Circle, is devoted to international studies, particularly international relations, diplomacy, and economics. (It is familiarly known as "SAIS," pronounced like the second syllable of precise). SAIS has full-time international campuses in Bologna, Italy and Nanjing, China. Founded in 1943, the School became a part of the university in 1950. The Peabody Institute, founded in 1857, is the oldest continuously active music conservatory in the United States. Located in Baltimore's Mount Vernon neighborhood, it became a division of Johns Hopkins in 1977. The Conservatory retains its own student body and grants its own degrees in musicology, though both Hopkins and Peabody students may take courses at both institutions. The Johns Hopkins School of Nursing, founded in 1889, is home to the nation's first Peace Corps Fellows Program in nursing. Founded in 1909, the School of Professional Studies in Business and Education ("SPSBE") served the educational needs of working adults through flexible programming that allows serious students to complete degrees while maintaining careers. 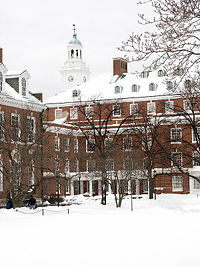 The school evolved from a teacher’s college within the Johns Hopkins University to one of eight major schools in the university. On January 1, 2007, the School of Professional Studies in Business and Education (SPSBE) separated into two new schools—the Johns Hopkins University Carey Business School and the Johns Hopkins University School of Education. The university also offers education abroad through centers in Germany, Singapore, and Italy. The university operates the Applied Physics Laboratory (APL) in Laurel, Maryland, which specializes in research for the U.S. Department of Defense, NASA and other Government agencies. The Space Telescope Science Institute is located on the Homewood campus and controls, analyzes, and collects data from the Hubble Space Telescope. The recently opened Information Security Institute is the newest addition to the graduate programs affiliated with Johns Hopkins. The Institute is the "university's focal point for research and education in information security, assurance and privacy." JHUISI is the only Institute in the Whiting School with an academic degree program, offering the Master of Science in Security Informatics (MSSI). The blueprints for a new programming board called The Hopkins Organization for Programming ("The HOP") were drawn on up during the summer and fall of 2006. Johns Hopkins supports 12 fraternities and four sororities sponsored by the Inter-Fraternity Council and Panhellenic society, including the fraternities Sigma Chi, Sigma Phi Epsilon ("SigEp"), Sigma Alpha Epsilon ("S.A.E. "), Delta Sigma Pi, Lambda Phi Epsilon, Beta Theta Pi, Alpha Delta Phi ("Wawa"), Alpha Epsilon Pi, Phi Kappa Psi ("Phi Psi"), Phi Gamma Delta ("Fiji"), and Pi Kappa Alpha ("Pike"), and the sororities Alpha Phi, Kappa Alpha Theta, Kappa Kappa Gamma, and Phi Mu. Approximately 1/5 of male undergraduates and 1/5 of female undergraduates belong to the Greek system. Most of the fraternities maintain houses off campus; the sororities tend not to do so. Hopkins has also invested heavily in improving campus life for its students with creation in 2001 of an arts complex, the Mattin Center, and a three-story sports facility, the O'Connor Recreation Center. The large on-campus dining facilities at Homewood were renovated in the summer of 2006. Hopkins has also advertised the "Collegetown" atmosphere it shares with neighboring institutions, including Loyola College, UMBC, Goucher College, and Towson University, as well as the proximity of downtown Baltimore's Inner Harbor. Athletic teams at Johns Hopkins are called the Blue Jays. The university's athletic colors are Columbia blue and black. (Sable and gold are used for academic robes.) Hopkins celebrates Homecoming in the spring to coincide with the height of the lacrosse season. Outside of the Men's and Women's Division I lacrosse teams, Hopkins participates in the NCAA's Division III and the Centennial Conference. The school's most prominent sports team is its Division I men's lacrosse team, which has won 44 national titles - nine NCAA Division I (2007, 2005, 1987, 1985, 1984, 1980, 1979, 1978, 1974), 29 USILA, and six ILA titles. 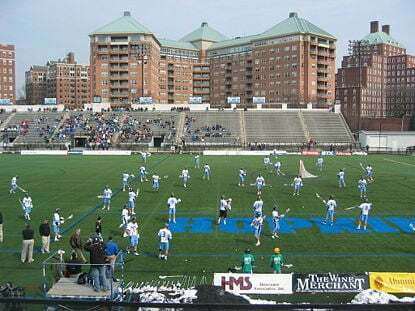 Hopkins' primary national lacrosse rivals are Princeton University, Syracuse University, and the University of Virginia; its primary intrastate rivals are Loyola College, Towson University, the United States Naval Academy, and the University of Maryland. Maryland is considered their most prominent rival in college lacrosse, the schools having met 103 times, with two of those meetings being in playoffs. Johns Hopkins alumni have gone on to great success in many fields. Johns Hopkins counts 16 Nobel laureates amongst its alumni, including president Woodrow Wilson. Other notable alumni include former vice-president Spiro Agnew, secretary of state Madeline Albright, educational reformer John Dewey, sociologist Thorstein Veblen, singer Tori Amos, news anchor Wolf Blitzer, and billionaire mayor of New York City Michael Bloomberg. ↑ Commencement 2001. Headlines@Hopkins. accessdate 2007-02-14 . ↑ About the Press The Johns Hopkins Press. Retrieved May 17, 2008. ↑ Our History Johns Hopkins Medicine.org. Retrieved May 17, 2008. ↑ Women (Or The Female Factor) Johns Hopkins Medicine.org. Retrieved May 17, 2008. History of "Johns Hopkins University"
This page was last modified on 24 May 2018, at 15:31.